The first several months of Stefanie Ural’s first pregnancy had been blissfully uneventful. She was due in November 2018, and everything was progressing normally. But then, in August, she experienced strong abdominal pain, which her doctor had assured her was nothing to worry about. In September, after Ural had a bad night’s sleep, her doctor ordered an ultrasound, which revealed that the baby was very small. The next day, a maternal fetal medicine specialist diagnosed placenta insufficiency, which meant the baby was not getting enough oxygen and nutrients, and thus was growing too slowly. Ural, who lives in Holmes (a hamlet of Pawling in Dutchess County) with her husband, George, was referred to Westchester Medical Center, the flagship of the Westchester Medical Center Health Network (WMCHealth) — where she also happens to work as an office manager in the Department of Cardiology. “The doctor said I needed to be monitored 24/7. He didn’t know what was going on yet, but he knew it wasn’t good,” she recalls. The situation worsened as the baby struggled to get enough nutrition through the umbilical cord. Ural’s pain intensified, with what felt like severe heartburn, and soon progressed to nausea and vomiting. The nurses told her to call her husband. “They said it was serious,” Ural says. Additional testing revealed the extent of her condition. She was diagnosed with HELLP syndrome, a group of symptoms that include a breakdown of red blood cells, dangerously low platelet count and elevated liver enzymes and dysfunction. HELLP is considered to be a variant of pre-eclampsia, a potentially life-threatening condition for expectant mothers marked by dangerously elevated blood pressure. HELLP syndrome is uncommon, impacting about 1 to 2 out of 1,000 pregnancies — and the cause remains unknown. 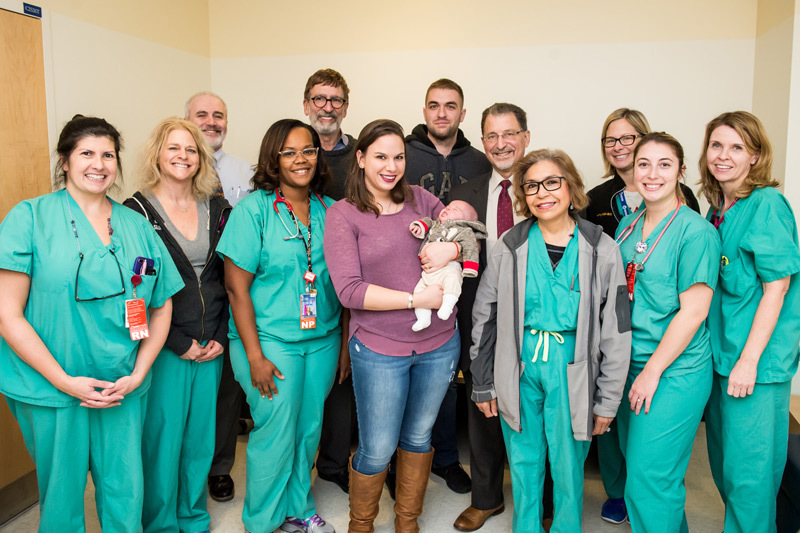 “As a regional perinatal center, we see many of these cases,” said Lindsey LaPointe, MD, the obstetrician/gynecologist who cared for Ural at Westchester Medical Center. As with pre-eclampsia, the only way to cure HELLP syndrome is to deliver the baby. If the condition progresses too far, it can be fatal to both mother and child. “They told me the goal was to save me, and if possible, the baby,” Ural says. So the doctors kept close watch on Ural while waiting as long as possible to give the baby more time to develop. Aptly, on Labor Day, September 3, it was time to act. Jake Thomas Ural was born by Cesarean section, performed by Dr. LaPointe, at just 29 weeks and three days. Weighing just under 2 pounds, he was rushed to the Regional Neonatal Intensive Care Unit (RNICU) at Maria Fareri Children’s Hospital, a member of the WMCHealth, where he would remain for three months. Following delivery, Ural’s symptoms improved almost immediately. Jake Thomas, however, faced a harder struggle. “Historically, surviving at 28 weeks’ gestation is a miracle. Now it’s down to 23 weeks,” says Edmund F. La Gamma, MD, Chief of Newborn Medicine and Director of the Regional Neonatal Center at Maria Fareri Children’s Hospital. He credits better pharmacology, improved nutrition and advanced technologies available to specialists. In babies that young, nearly every organ system is underdeveloped and needs support. Jake’s lungs, for example, required medication and a specialized apparatus to help him breathe. His heart had to work hard until a shunt between the two major vessels from the heart could be closed. The shunt, which is normal for infants in utero, closes in the first couple days after birth if the baby reaches full term. With Jake, medication was needed to close it for him. His immature intestinal tract was not yet ready for food, but neonatologists and infant-nutrition specialists knew that the mother’s breast milk, fed to the baby through a tube in the nose or mouth, supports intestinal development and adds nutrients, antibodies and other chemicals that support immunity and aid digestion. Neonatologists also worked hard to promote brain development, fight anemia and, as Dr. La Gamma puts it, “coax each body system” toward maturation. 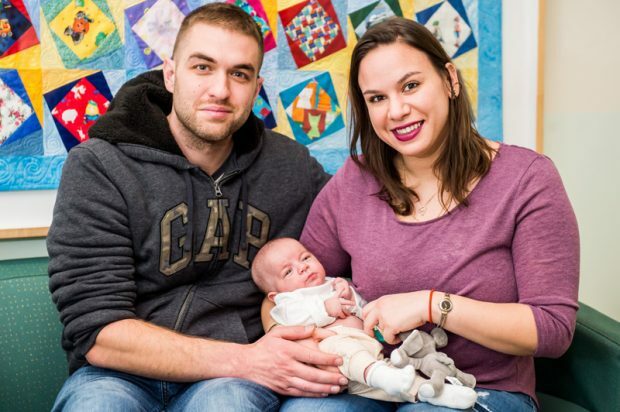 “The success of Jake and his mother illustrates the value of regionalized perinatal services concentrating in one place the best obstetrical and neonatal teamwork and technology in the world. It is that combination that makes these tiny miracles occur,” says Dr. La Gamma.